For taijutsu, it is primarily important that the body is soft and elastic. Then you have to be smooth. A witty reaction must occur spontaneously. Taijutsu is a method of warfare where you can also fight without weapons. The Ninja’s taijutsu is a method of warfare where the whole body is a weapon, and that one can use throughout their lives. Taijutsu is something that a ninja spontaneously learns to use, with all parts of the body. Taijutsu is something that permeates the body and makes it so strong that it can not lose to anything. The reason for this is that the head can only be counted as part of the whole. Therefore, we require that the body be sharp. In ancient tales, there is a story about ninja who sowed hemp seeds, and leaped over it every day, even when it had grown to full length. There are also stories of how they jumped over bamboo sprouts and Sorghum (Chinese grass). These fables tell that it was a necessary prerequisite to acquire an ability to jump high to master Ninpō Taijutsu. By starting the day with a proper diet, and practicing a fixed routine of preparatory exercises to gain an ability to move as smooth and elastic as possible. This is because those that are supple are also the strongest and has the best recovery capability. Turn the toes individually or in pairs twenty times each, both clockwise, and counterclockwise. Turn the soles of the fee upwards and raise the foot’s arch by pushing the thumb into it ten times. Hold the ankle in one hand and the foot with the other; turn the ankle ten times both clockwise and counterclockwise. Hold the foot by the toes and bend them all forwards and backwards ten times. Sit straight with the soles of the fee together and place the knees on the ground using only the leg muscles and repeat ten times. Sit straight with the legs stretched straight out. Open the legs as far as possible with the toes curled back. Without bending the knees, reach and touch the toes ten times. With both legs stretched straight out infront and the knees straight, reach and touch the toes ten times. Lay prone face up, body straight with the palms down and lift the legs over the head, placing the feet on the ground above the head. Breath slowly three times then return to the fully prone position. Repeat ten times. Lay face down with the body straight and lift the body with the arms, allowing the waist to bend backwards and tilt the head back. Rock the body into seiza no kamae (correct seat; 正座) without moving the hands. repeat ten times. Sit in seiza with the feet slightly apart and sit down on the ground. Lie back with the arms straight over the head and breath. repeat ten times. Rotate the fingers one by one ten times each, pulling them three times each. Clasp the hands together and rotate them in a figure eight in both directions ten times each. Rotate the shoulders forward and back ten times. Rock the head back and forth, left and right, clockwise and counterclockwise ten times each. Keep the head facing forward and with the eyes only look up, down, left, right, diagonally, then roll them clockwise and counterclockwise ten times. Standing naturally, stretch the achilles tendon ten times, bend the knees and waist and roll them ten times , then roll the arms forward and backward ten times. 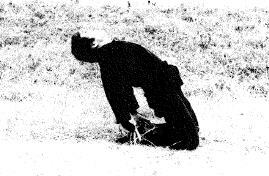 Standing naturally in shizen no kamae, raise and swing the hands and feet in front and behind ten times each.